Former head of the Party of Regions faction in the Verkhovna Rada, Oleksandr Yefremov, has been detained on suspicion of violation of the territorial integrity of Ukraine, Ukraine's Prosecutor General Yuriy Lutsenko has said. 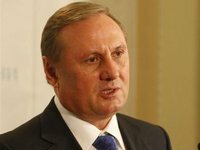 "Ex-head of the Regions Party faction Yefremov has been detained on suspicion of infringement of the territorial integrity and inviolability of Ukraine," Lutsenko wrote on his Facebook page on Saturday. "He has been detained at the airport with a ticket to Vienna this morning," the press secretary of the Prosecutor General, Larysa Sarhan, told Interfax-Ukraine on Saturday.